Fiber Flux: How to Make Bendy Scalloped Ornaments! How to Make Bendy Scalloped Ornaments! I love the idea of putting a little ornament on someone's gift. It not only decorates the gift with a handmade touch, but the recipient can use it later too! 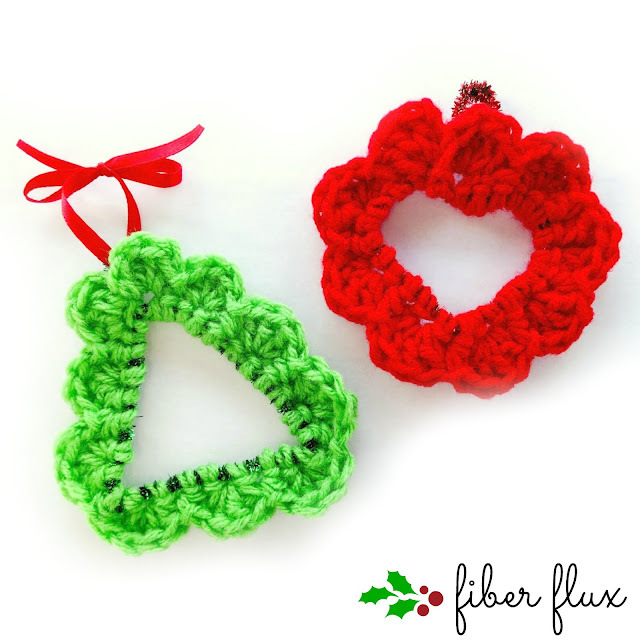 Here are some fast and pretty ornaments you can make in just about any shape with just some yarn scraps...hooray for using up yarn leftovers! Begin by tying yarn right onto the pipe cleaner about an inch or so in. Any length pipe cleaner will work for this project, the longer the pipe cleaner, the bigger the finished piece will be. Sparkly ones are optional too! Next, work single crochets all the way across in multiples of three. Stop when there's about an inch or two of pipe cleaner left. You can scrunch the stitches together, but I kind of like how the sparkles show through a bit. Work three double crochet into the very first stitch. In the next stitch, work four double crochet. After that, work a slip stitch in the next stitch, then skip the next stitch. Keep going in this manner, four dc, sl st in the next st, skip the next st until you reach the end of the row. When you finish that very last scallop, also work a sl st after the 4 dc to finish off the scallop at the end of the row. Fasten off. Bend the form into any shape you'd like: star, heart, tree, even a letter! Give the ends a twist and form a little hanging loop as shown below. There will be a small gap where the scallop ends came together (where the hanging loop is) With remaining tail, place a stitch or two to join top most scallops together. Weave in any ends that remain. You can tie a ribbon as shown to attach it to a gift or a tree, etc. Great idea..Beautiful....do you have instagram? Thanks so much! I don't have it right now, do you like using it? Wow - thats sooo cool! Fab idea...thanks for the inspiration! supercool idea! i am glad to be a follower of your blog! Thanks to you too Steffy!